Lots going on in the Northern Virginia area this weekend! You’ll probably find us out apple picking as it’s that time of year, but be sure to check out some of these great tastings too! At Out of Site Wines in Vienna, tonight, from 5-8pm you will be able to sample 2 Australian wines, a Chardonnay and Shiraz/Grenache Mourvedre blend that sounds very interesting. On Saturday from 1-4pm at Out of Site you will find “Autumn Weight Wines” poured by the County Vintner, including a Shiraz-Viognier, something I’ve been dying to try! Head on over to Arrowine in Arlington tonight from 5:30-7:30 to find a tasting that is great for WBW! Value wines of Portugal poured by Dionysos Imports. Find yourself at Arrowine tomorrow from 1-4 and Michael Downey selections will be pouring Italian wines. At the Curious Grape in Shirlington tonight from 6-8pm you will be tasting “Earth and Vine American Wines” including a CA Sauvignon Blanc and a WA Cabernet Sauvignon. You can stop by on Saturday for a tasting of fine chocolates as well! First of note, is a wine dinner coming up on June 4th being hosted by Church Street Cellars in Vienna. The dinner will take place at Bazin’s on Church and feature a Robert Mondavi Reserve Wine Dinner. The festivities begin at 6:30 with appetizers and the cost is $100 per person. Entrees include Pekin Duck, Double Thick Lamb-Chops…..reservations will be taken by the restaurant at 703-255-7212. Church Street will be tasting on Saturday from 12-3 with Grappoli Imports. Wines include: Barbi Orvietto, Graofoli Sparkling, James Judd Cabernet Sauvingon and James Judd Petite Verdot. On Sunday from 12-5 and Monday from 12-3 Church Street will feature 16 wines from an Enomatic Wine Dispenser! It looks like they may be getting ready to introduce this feature in shop in the future! Today from 6-8 at the Curious Grape in Shirlington you will find Artisanal American Wines and Chocolates on the tasting bars. Wines will be featured from California, Oregon and Washington. On Saturday the Curious Grape has All New-Zealand Favorites looks like a great line-up, including one of my favorite summer styles, a Marlborough Sauvignon Blanc. If you are in town on Monday, head to the Curious Grape from 10-2 and receive a 20% case discount mix or match. Nothing is excluded, so take this opportunity to pick up some of those wine’s you’ve been eyeing or perhaps to do your own at home mixed case learning as Eric Asimov of The Pour has been encouraging us to do! Arrowine in Arlington offers wines from Dionysos on the tasting bar tonight from 5:30-7:30, indcluding a French Rose and a red Portugese wien they claim is perfect for grilling. On Saturday from 1-4 Arrowine will be featuring a dozen wines in a SuperTasting of Tuscan Burgundy and Other Wines of Terrior from Rosenthal Wine Merchant. Out of Site Wines in Vienna is also featuring a Memorial Day Weekend special, though be careful as you will have to carry your wines due to the street being closed for the ViVa Vienna Festival. On Saturday and Sunday they are offering $20 off any purchase of $250 or more if you mention the ViVa Vino Vienna Email Special. Try saying that 5 times fast. Saturday from 12-2:30 Out of Site will feature Portugal, France and Spain with a Verdelho, a Sancerre and a Grenache/Tempranillo blend. From 2:30-5 they will feature a selection from Grappoli Imports including a Prosecco, a Verdicchio and a Sangiovese. On Sunday at Out of Site you will find, from 12-2:30 Sauvignon Blacn from Chile, Chardonnay from France, and Malbec from Argentina. From 2:30-5 look from a Veltliner, a Garnacha and aPaso Robles Cabernet Sauvignon. Not to mention, if you are feeling adventureous and want to leave the hectic tourism of DC behind you, the West Virginia Wine and Arts Festival is going on from Saturday-Sunday. It’s located at 601 South Queen Street in Martinsburg, WV. The cost is $15 per person and looks like a great way to spend a Memorial Day weekend. Be safe this weekend and I hope that everyone has a festive and relaxing Memorial Day Weekend! The Curious Grape in Shirlington will be hosting an Easter Wine Pairing on Saturday from 1-4. At least 4 wines will be poured. On Monday at the Curious Grape the winemaker from Langmeil in Australia will be pouring 3 of his Shiraz offerings and the Curious Grape will also have 2 Australian whites available from 6-8pm. At Out of Site Wines in Vienna tonight you will find Springtime selections on the tasting bar from 5-8pm. On Saturday from 1-4pm Out of Site Wines will be having a double sized tasting bar with one featuring appetizer and ham wines for Easter and the second table featuring lamb and dessert wines. Tonight at Arrowine in Arlington you will find wines from around the world being poured from the Country Vintner from 5:30-7:30pm. On Saturday from 1-4pm at Arrowine you will find a Taste of Oregon on the tasting bar. 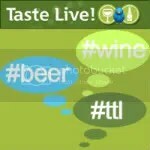 Lots of great tastings in the area for you to check out this weekend! On Saturday Out of Site Wines in Vienna, VA will have “Superstars from France and Spain” on the tasting bar from 1-4pm. Tonight at Arrowine in Arlington you will find a tasting off Italian wines from 5:30-7:30pm. Saturday at Arrowine there will be more than 10 wines being poured at the Super Tasting of values. At the Curious Grape in Shirlington from 6-8pm tonight is a tasting of Springtime in Italy. Tomorrow at the Curious Grape from 12-4pm is the Art of the Blend featuring “interesting” blends. On Wednesday, April 4, at the Curious Grape (I know, not the weekend, but you’ll deal) are New Arrivals from Austria from 6-8pm. Spring Selections from France and California will grace the tasting bar at the Curious Grape on Thursday April 5 from 6-8pm. Tonight at Church Street Cellars in Vienna, VA wines from Australia will be poured. So, being the wino I am, I am signed up for a ton of local wine shoppes’ email lists and I get updates (really, a ton of them) about local tastings and what’s happening on the weekends. I thought I’d try doing a quick summary of the events you can attend in the DC Metro Area. At Arrowine in Arlington tonight there is a free tasting of Spanish wines being poured by a rep from Elite Wines. It runs from 5:30 to 7:30 and you get a discount (typically 10-20% on any wines purchased that were tasted). Tomorrow at Arrowine from 1-4 there’s another tasting of wines from Michael Downey Selections. At Out of Site Wines in Vienna tonight from 5-8 there is a pouring of wines from Schild Estate wines from Australia. Tomorrow at Out of Site you will find 5 wines from JAO Imports being poured, including a 2005 Fontaine-Gagnard Bourgogne blanc and a 2001 Christia Beaumes de Venise. At the Curious Grape in Shirlington tonight you will find Not to be Missed French Values and Irish Cheeses from 6-8. Tomorrow at the Curious Grape there is an Italian Winemaker tasting from 1-3. As always, you’ll get a tasting bar discount and more if you buy a case, even a mixed one. That’s it for now, thought I’m still missing a few emails. The overwhelming impression I got from this wine was that it tasted like a Chardonnay grape. 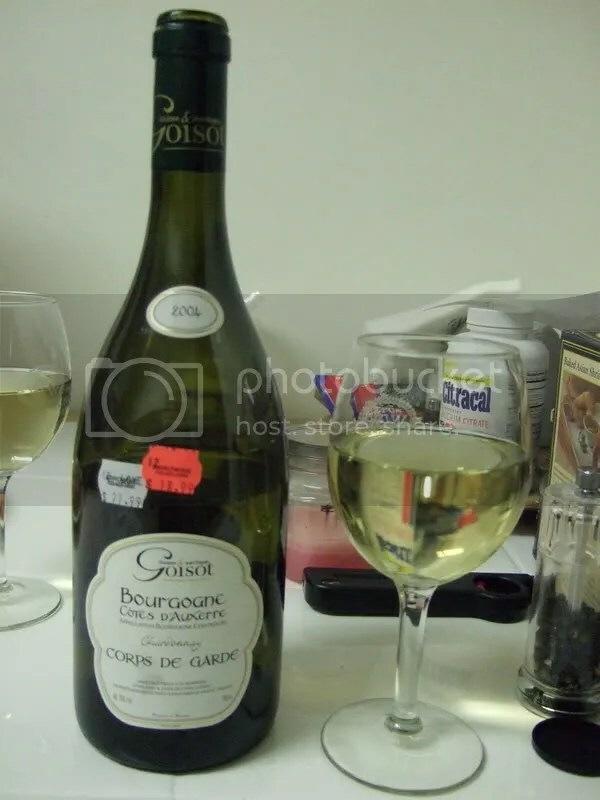 Last night’s bottle was a 2004 Goisot Bourgonge Cotes D’Auerre Chardonnay. We picked this up for $17 at Arrowine when we went tasting there a few weeks ago. And yet again, I remember liking it a lot more in store than I did at home. The wine had a real cork clousre and is 13% alcohol by volume. Besides having the flavor of a Chardonnay grape, on the nose of this bottle there was spice. A really spicy spice, like ginger or ginger root. It was odd. In the mouth there was more Chardonnay grape and just a touch of citrus. The finish was long, and overall it wasn’t an unpleasant wine, it just didn’t work for me. 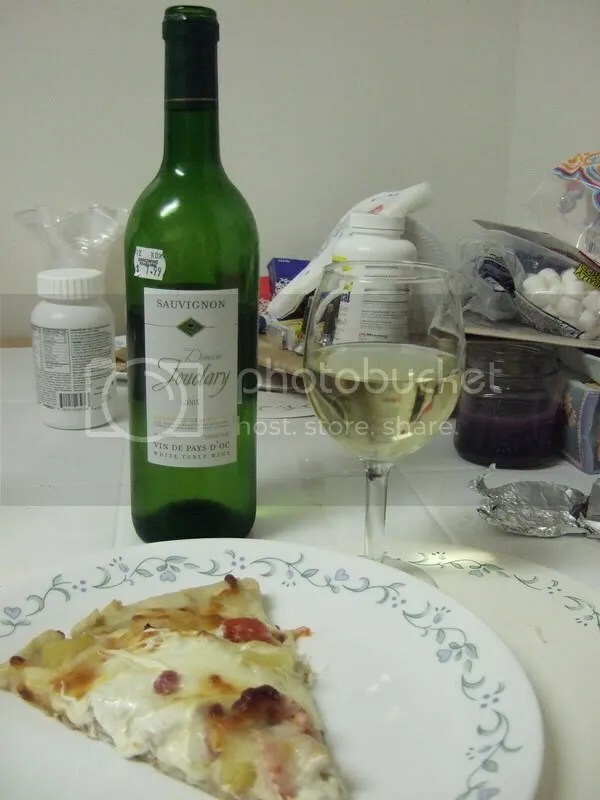 I served it with a mishmash of leftovers from this week, and I though maybe I was doing a diservice to the wine. However, hours after dinner, it still wasn’t doing much for me and I wasn’t finding anything else but the spice and Chardonnay grape. NMS. My little notebook of wine tastings got left in the car when we were out buying wine on Saturday, so I’m a touch late with my Thursday night wine review. 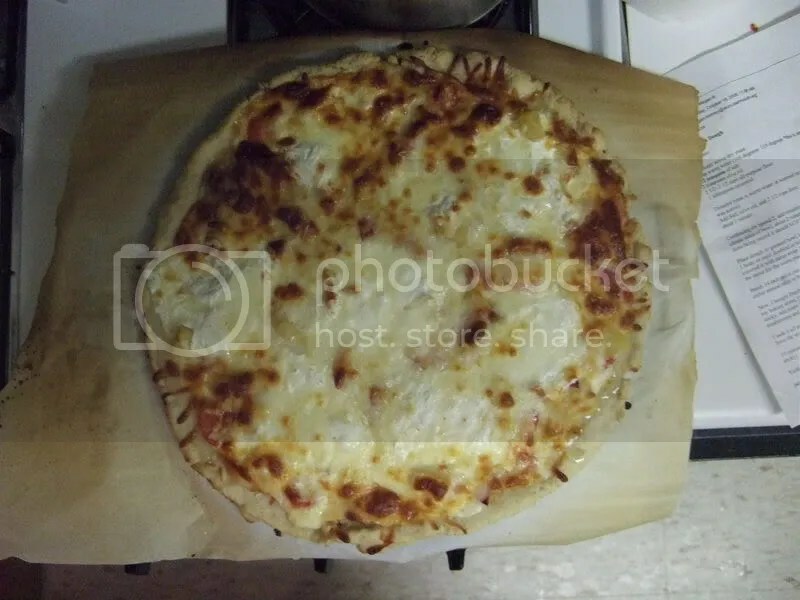 Today you get a picture of both the wine and the dinner, mainly because I’m extrememly proud of my pizza making skills, and two, to show my friends and family that I can cook (see, homemade crust and all!). The bottle was a 2005 Domaine Jouclary Sauvignon. Picked it up at Arrowine for $7.99 in our quest for everyday wine. It had a synthetic cork and weighs in 13% alcohol by volume. Melon on the nose, with a slight acidic note. In the mouth there was melon, lemon and a creamy feel. I almost want to say there was just a touch of a butterscotch taste in there. It was interesting for a $7.99 bottle of wine, I’d try it again.